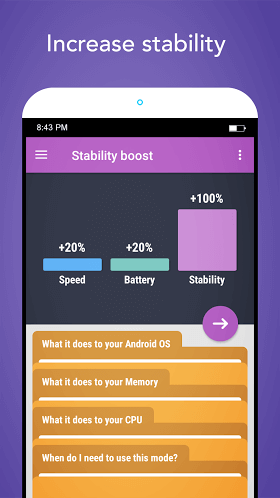 Each Android application can have one or multiple services. They run in the background and usually perform some kind of task. Many people think that when they kill an application, it completely stops draining your battery and computing power, but that’s not true. Application still have servicies that are running after killing and still drains battery and comuting power. On the other hand, if you hibernate an application it stop it’s services and application does not drain battery and CPU computing power anymore. 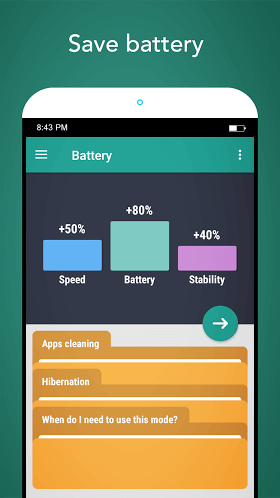 Hibernation is gently and efficient way to save your battery and increase performance. Each application uses VM heap for it ‘s data and work. The main reason to change the VM heap size is stability improvement. Many big applications need a big amount of memory (VM heap) for their work. If the VM heap size is smaller than the requested memory, it causes an application crash (Out of memory error). Setting heap size is hard task and there is no manual to set up for better performance. Better performance can be only achieved by testing.